At the end of every season the WolfPack hosts a banquet to celebrate their top performers. This year saw a lot of familiar faces receive some top awards. Olga Savenchuk had a big night winning two awards. Savenchuk was the winner of the Sports Task Force female athlete of the year award. She also took home the female newcomer of the year. Olga was named a Canada West first team all-star and was fourth in Canada West in kills (340) and kills per set (3.78). Savenchuk beat basketball star Michelle Bos to the award. Grimm was complimentary of his star player. Savenchuk managed to beat Chantal Gammie in the race for newcomer of the year as well. In other awards, Michael Rouault won the Cliff Neufield leadership award for the second straight year over soccer’s Thomas Lantmeeters and volleyball’s Tim Edge. Tim Dobbert was the Sports Task Force male athlete of the year. Dobbert had an excellent final season at TRU that included an all-Canada team selection. He is also in consideration for the KSOC university athlete of the year award. TRU swim team sensation Ryley McRae was named the male newcomer of the year. He is the first swimmer from TRU to ever qualify for the USports nationals. The winners of the evening were the women’s volleyball team, who had all four awards on the women’s side. In addition to Savenchuk’s two wins, Kendra Finch won the Cliff Neufeld leadership athlete of the year. 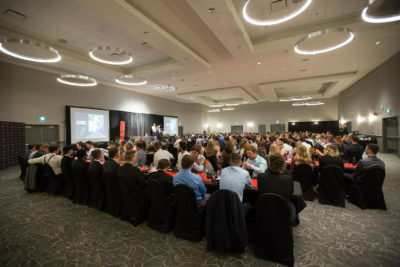 Finch received the award due to her role as a coach of a U14 team with the Kamloops Volleyball Association and her involvement with the I Believe You campaign that raises awareness about sexual violence. Grimm was very effusive when speaking about Finch. “I appreciate Kendra’s continued contribution to our program and institution and the example she provides to our team,” he said. The fourth award went to teammate Avery Pottle who won the Doctor Roger H. Barnsley award, an award Finch won the last time around. To conclude the evening the WolfPack’s fifth year and graduating players were honoured. The banquet is always a special event as it brings recognition to those that are deserving but it also ushers in a new era for the program.